Social electronic enterprises (e-enterprises) are an important part of the global business environment, which have developed from technological innovations that have enabled businesses to create and sustain financial endeavors that have an integrated social aspect. Part of the increase of social e-enterprises has been led by mobile social networks growing in popularity as people utilize mobile communication technology to communicate with stakeholders that are part of their social network. This form of community interactivity represents a technology innovation that has a strong combined business and social potential. This has enabled mobile social networks to form part of a social e-enterprises computer mediated communication that impacts the way technology is marketed to people. 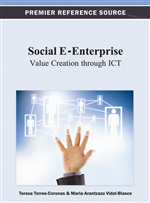 The purpose of this chapter is to review the existing research on technological innovations in social e-enterprise and mobile social networks by providing a set of research propositions that can be used to understand the adoption of social technology innovations. Suggestions for future research and practical marketing implications of social technological innovations in the context of facilitating social e-enterprise through mobile social communities are also stated. There are a variety of theories to explain technology innovation adoption depending on the context and determinants of the adoption process. There is not one specific theory that fully explains technology innovation adoption. Instead some researchers have combined different theories with different contexts to understand adoption decisions. There are a variety of technology characteristics that influence innovation adoption including relative advantage, complexity, communicability, divisibility, cost, profitability, compatibility, social approval, trialability and observability (Tornatsky & Klein, 1982). Theories about technology innovation adoption usually include various attributes affecting the adoption process. These attributes are influenced by different contexts which form potential determinants of technology adoption (Rogers, 1995). The characteristics of an individual together with environmental factors will influence technology innovation adoption decisions.